Botanical printing– also known as eco-printing– has a large and dedicated following. The sustainability of materials and inherent organic beauty of the imagery is deliciously appealing. But consider a new twist on beloved printing methods. 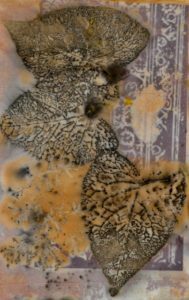 This workshop explores nine additions to botanical printing on paper/fabric substrates to create a series of collages suitable for framing, stitch, or other distinctive and personal use.